If you have ever done any serious woodworking, you might have looked at portable planers. If you have, you’ve seen that most of them have 12 or 12 ½ inch blades, and only a few are 13”. In order to get a planer with a capacity greater than that you need to buy a large expensive floor mounted model, that weighs thousands of pounds. What does all this have to do with electric guitars? Here’s the facts: The JET Earlewood is the only solid-body guitar in the world – with or without routed chambers – that is over 13” wide. It is 13 ½”. Unless you specify the petite model. (Same Price). Maybe it’s only a coincidence that no other solid guitar body will fit through a small portable planer. But I think the reason is that the initial designs of Leo Fender, Ted McCarty & Paul Reed Smith were all limited by the equipment available in a small shop, which after all, is what they all had to start out with. Jeffrey Earle T. took an entirely different approach, one not influenced by the machinery available. He designed the Earlewood for guitarists who are tired of smaller and smaller body designs, and want to go back to a body that has more substance, resonance, and visual appeal. The Earlewood is not only wider than a PRS, it is also thicker. 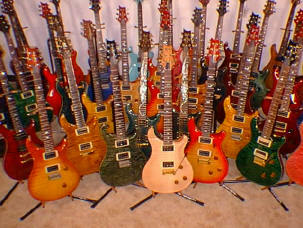 In fact, it comes in four different thicknesses, the largest being 2”, and even this one is no heavier than a PRS Custom. One, the body is extensively chambered to cut weight and increase resonance. Two, the top is joined to the body in a completely different manner than the way PRS, Gibson, Hamer, or any other guitar maker does it. Instead of gluing a thick maple cap onto a flat tone-wood body, the book-matched maple starts out a little thinner, and is press glued onto a body that is specially milled with a roof-like peak. This way you get a better proportion of tone-woods in the body. The best of both worlds: The weight and tonal response of a thinner top, and the cool look and feel of a sculpted figured top. Would you rather have a PRS 22, or 24 fret model? Of course you want the range and better playability of the 24. But if you compare the neck pickup response, the 22 sounds better. That’s because in order to add two more frets, PRS adds another inch to the fingerboard, and has to push the pickup closer to the bridge. JET, however, has a solution to this problem. They put a brass end-piece on the end of the fingerboard that acts as a 24th fret. Without the extra overhanging wood, they don’t have to knock the pickup completely out of its sweet spot. Again, the best of both worlds. The pickups are also direct mounted, giving a subtle microphonic coupling effect. That may sound bad, but in fact it produces a vast improvement in tonal complexity and resonance. That’s why Eddie Van Halen demanded this mounting style in both his signature models, from two different companies. Then there’s the electronics. With JET you can choose between traditional Les Paul wiring (with the special JET tone controls) or a simple, but effective, PRS-like scheme… As far as the neck goes, the Earlewood is starting to gain a reputation as the dreamiest neck in the business, and this is due in no small part to the compound radius fingerboard along with the hand carved soft V neck profile. (Naturally these can be custom varied per individual taste.) The coup de grace is the unique jack placement, putting your unruly cable back in its place. COMPARE PUBLISHED FEATURES WE DID !!!!! Matching Headstock No Not Available Yes Same Color Same Wood "Free"
All JET Guitars are totally HAND MADE one at a time from beginning to end by Jeffery Earle Terwilliger himself. There are no whirring computer controlled routers or other robotic machines at JET guitars. Just old fashioned Old World Craftsmanship. Very few companies can make this claim and still deliver such a high grade of consistent quality.